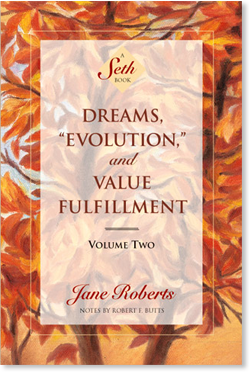 Dreams, "Evolution," and Value Fulfillment, Volume Two (eBook) - Amber-Allen Publishing, Inc.
Volume One describes a conscious, self-aware universe where possibilities and potentials generate life forms. This book answers crucial questions about the significance of Seth’s thought system, while chronicling the worsening health problems that led to the death of Jane Roberts. Volume Two continues Seth’s explanation of how the physical world is an ongoing self-creation. He explains how the human species keeps within its genetic bank millions of characteristics that might be needed in various contingencies, and how the soul employs both physical handicaps and advantages as springboards for further achievement. Seth also expands upon his vision of a thoroughly animate universe where virtually every possibility is not only implicit, but constantly encouraged to achieve its highest potential. From Chapter 8: WHEN YOU ARE WHO YOU ARE. The Worlds of Imagination and Reason, and the Implied Universe. Beyond certain levels it is almost meaningless to speak in terms of particles, but I will for now use the term “invisible particles” because you are familiar with it. Invisible particles, then, form the foundation of your world. The invisible particles that I am referring to, however, have the ability to transform themselves into mass, or to divest themselves of it. And the invisible particles of which I speak not only possess consciousness — but each one is, if you will, a seed that contains within itself a potential for an infinite number of gestalts. Each such invisible particles contains within itself the potential to embark upon an infinite number of probably variations of consciousness. To that degree such psychological particles are at that stage unspecialized, while they contain within themself the innate ability to specialize in whatever direction becomes suitable. They can be, and are, everywhere at once. Sometimes they operate with mass and sometimes without it. Now you are composed of such invisible particles, and so is everything else that you can physically perceive. To that degree — to that degree —portions of your own consciousness are everywhere at once. They are not lost, or spread out in some generalized fashion, but acutely responsive, and as highly alert as your familiar consciousness is now. The self that you are aware of represents only one “position” in which those invisible particles happen to intersect, gain mass, build up form. Scientists can only perceive an electron as it is to them. They cannot really track it. They cannot be certain of its position and its speed at the same time, and to some extent the same applies to our consciousness. The speed of your own thoughts takes those thoughts away from you even as you think them — and you can never really examine a thought, but only the thought of a thought. Because you are, you are everywhere at once. I am quite aware of the fact that you can scarcely follow that psychological motion. As you will see later, your imaginations can lead you towards some recognition, even toward some emotional comprehension, of this concept. While your reasoning abilities at first may falter, that is only because you have trained your intellect to respond in a limited fashion.